The main concern when brewing small beers is how to maintain body. There are really three factors that can be altered to up the body of a brew: mash temperature, grist, and yeast. Mashing at higher temperatures tends to result in a less fermentable wort, meaning the finished beer ends up containing long-chain sugars that make the beer feel fuller without tasting sweet. Similarly, more highly kilned malts like crystal malts or kilned base malts can be used to contribute unfermentable sugars, although the fermentability of crystal malts is somewhat debated. Another trick is to incorporate oats into the grist, which supposedly adds a silky and smooth mouthfeel due to proteins found in oats. This too is under some debate, eliciting a lively discussion at a New York City Homebrewers’ Guild meeting last year. Finally, a low attenuating yeast or a saison strain can yield fuller body. Low attenuating yeast also leaves residual sugar in the beer, but this may be long and short sugars, which may leave the beer tasting sweet. The mechanism by which a saison yeast contributes body is unknown to me, although I’ve read claims that it has to do with polysaccharide production. With all this in mind, I’ve changed to Vienna malt, which is slightly more kilned than pale malt, as my base malt. I’ve bypassed oats for this brew, since the supposed contribution from oats is more appropriate for a slick stout than my session ale, and my experience with oats has been lackluster. I considered choosing S-04 for this brew, since it is lower attenuating than US-05, but I decided that I’d rather use the more flavor neutral US-05 while I play around with acid malt and brewing salts. Which brings me to a technique that I’m excited to try for the first time: water treatment. Just prior to departing for England I read Palmer and Kaminski’s new book, Water. In their terrific exploration of brewing water, they note that chloride ions can add a sense of fullness and body to a beer. They also note the important of calcium for both acidification reactions in the mash as well as a yeast nutrient and flocculation aid. 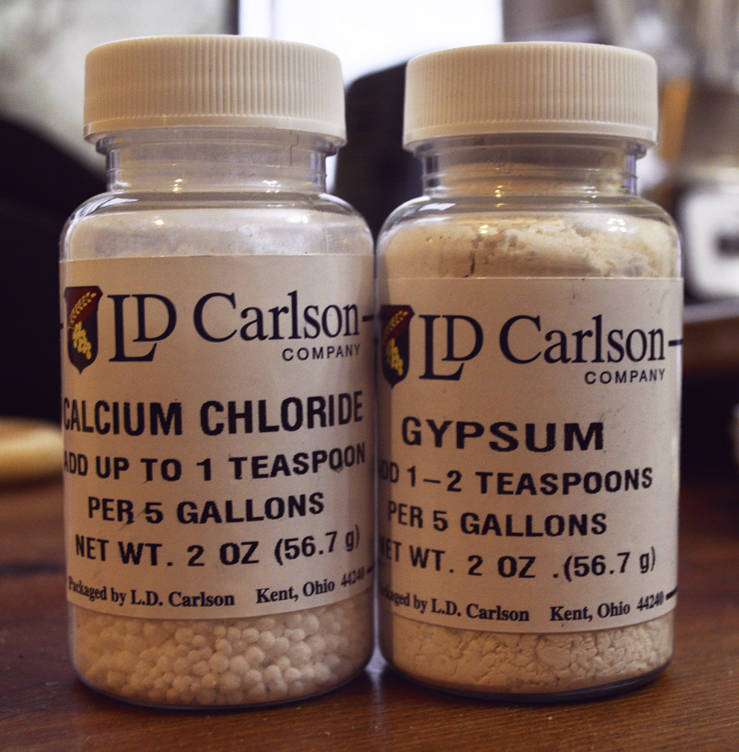 Inspecting a New York City water report, I learned that my tap water is virtually free of all minerals, including critical calcium and flavor ions like chloride and sulfate. With this new knowledge I formulated water additions to correct these deficiencies (and in the future will also conduct a test mash to help predict my mash pH and see the effect of acid malt additions). I undershot my mash temperature but added more strike water until the mash stabilized at 152 F, which I let rest for 45 minutes (total time in the range of acceptable mash temperatures was 60 minutes). I didn’t have any iodine on-hand to test for conversion, but would have liked to. I also had some trouble measuring my volumes and gravities, and seemed to get some nonsense on that end, but after the boil I seemed to end up with 5.5 gallons of 1.036 wort, which was very close to what I was aiming for. The beer is currently fermenting with US-05 held between 68 and 71 F, and activity seems to have tapered off after 4 days. I added my dry hops and orange zest and will rack off them to bottle after just 3 days. It’s all a bit of a rush, but I’m hoping to push this beer from grain to glass in time for a New York City Homebrewer’s Guild club competition on August 19th.